In Moscow, Jack McClure and Annika Dementieva are charged with getting Annika's grandfather, Dyadya Gourdjiev's out of the country to evade those who are trying to seize his powerful secrets. In the meantime, Secretary of Defense Dennis Paull is in Washington, DC, working with two detectives to uncover the secret activities of their chief of detectives. And in another part of the capital, Alli Carson and her friend Vera are trying to expose a cyberstalker who has targeted Alli. 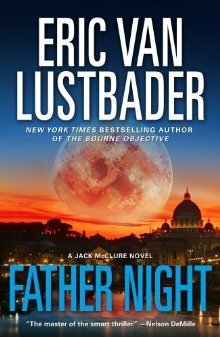 Father Night is Eric Van Lustbader's fourth novel in the Jack McClure series. You can read my reviews of the other three below. It continues the story of Jack, a special agent with an innate ability to see things others miss, and Alli, the former president's daughter who has grown much stronger since her abduction in the first novel of the series. Both experience many changes in their lives in Father Night, particularly in their relationships with others. Several of the other characters who have been featured in the series face their own changes as well. As with the rest of the series, this book is full of action and intrigue, with plenty of fist fights and gun fights, political corruption, lies and deceit. I will say that Father Night isn't quite as complicated as the others in the series, perhaps because I already knew most of the large cast of characters. There was still plenty of suspense in this fast-paced thriller, though, and a few unexpected twists and turns. If you've read the other books in the Jack McClure series, you're bound to like this one just as much. A warning though: While some things are wrapped up at the end, the story is far from over. When you turn the last page, you'll be looking for the sequel, which hasn't been published yet! Also, if you haven't read the other books in this series, don't start with this one. You'll be lost. Start at the beginning with First Daughter and move on from there. This review was written based on a copy of Father Night that I received from AuthorsOnTheWeb in exchange for an honest review. Why have I not read these books Julie, sigh, adding First Daughter to the list. Thanks for recommendation on reading in order.